This post comes from Dr. Sarah Doherty, a recent graduate of Loyola’s Public History/US History joint PhD program. This past summer I spent a week in Salt Lake City as an AP World History grader. I had ample opportunity to visit local cultural institutions, but I was most interested in taking a look around Temple Square which is the headquarters of the Church of Jesus Christ of Latter-Day Saints (LDS). The ten acre Temple Square compound was filled with pairs of helpful young women tour guides from around the world on their mission year. They cheerfully provided visitors with information about Temple Square, history of Mormons in Utah and if you stood still for too long read you scripture from copies of the Book of Mormon they all carried. In the North Visitors Center, guests to Temple Square are greeted with a history of the universe as told by the LDS. On my first visit I was accompanied by a group of other world history teachers who all had running commentary below their breaths about the “history” that was presented. I went back alone to revisit one exhibit that particularly piqued my interest. As seen in the above photo, a hippie looking Jesus spent some time hanging out with indigenous peoples of the New World. The exhibit label was titled “Jesus Christ Visited Ancient America.” I am not well-versed in biblical history or archaeology, but I am quite certain that the vast majority of scholars in these fields would agree with me that the widely accepted Christian cannon and historical record does not support Jesus traveling to the Americas. I stepped back from the exhibit as a tour group with a bunch of young children approached. The young female tour guide asked the children if they knew what Jesus did in the New World. The children, in their excited voices, all chimed in that Jesus taught the Aztec and Maya how to read and write. The tour guide affirmed their answer and all the parents of the children nodded in agreement. As a teacher of Native American history I found the entire lesson and historical interpretation of the exhibit troubling. In thinking about revisionist history, how do we evaluate historical interpretations that do no support the established historical record? Do we simply dismiss the Mormons, one of the fastest growing modern religions, as crazy folk on society’s fringes? Or, must we give serious consideration to world and biblical history as presented by the LDS? A rather interesting topic. Sad that I missed this dialogue at the round-table. First of all, nowhere in the LDS Church does not (I repeat, does not) appear that element of revisionism mentioned above. I cannot explain why those kids answered that way but maybe it was because of the exhibit portrayed in the picture (how old were they? did the young female tour guide talk about other things?). By the way, that “hippy looking Jesus” is not depicting Jesus-Christ but probably an ancient prophet, as prophets were the ones keeping the religious records. I think there is another panel in the right that is cut out from the picture that (hopefully) interprets whatever is going on this diorama. Indeed, the doctrine of the Church as found in the Mormon cannon, talks of advanced civilizations (plural) in the American continent (it doesn’t specify where, and today the Church has not officially back up any scholarly interpretation about this issue), that built cities, had a system of writing, and complex political and economic systems. All of them long before, at least 1,000 years, the historical Jesus of Nazareth was born. These doctrines are taught to children as well as to adults all throughout the Mormon world. About Christ visiting the Americas. As far as I am concerned, there is no physical evidence, besides the account found on the Book of Mormon, that supports such claim. For those that challenge the Mormon doctrine, the simple fact that Native Americans throughout the continent did not know about Christianity is enough proof to debunk this belief. Nevertheless, Mormon religious scholars contend that there are several elements in the Bible, widely accepted by other Christian faiths and not based in historical evidence, that provide credibility to this event. Other LDS scholars have paid close attention to Mesoamerican traditions described in early European accounts, and the interpretations inferred from archaeological work. Their conclusion is that there are coincidences between those and the Mormons’ thesis. It would be great if Dr. Doherty could explain what (historical) elements were troublesome to her about the exhibit, besides the anecdotal encounter with that particular group of children, and a religious interpretation that can be equally compared to other faiths (i.e. saint, Virgin(s), and other supernatural visitations). I think it is important to acknowledge the fact that the LDS church has dedicated a somewhat significant financial support to foster historical debate around early American history. The two examples I can think of are the Neal A. Maxwell Institute for Religious Scholarship, part of Brigham Young University, and the Foundation for Ancient Research and Mormon Studies (FARMS), also associated with that institute. Thank you for the feedback on my post. F.J. It would have been great to have your input in last Saturday’s discussion. My comments were based on the presentation of one specific exhibit, how it was interpreted by a guide, the official Temple Square Visitor’s Guide and other literature I purchased in the gift shop, and how I interpreted and processed all the information that was available to me. 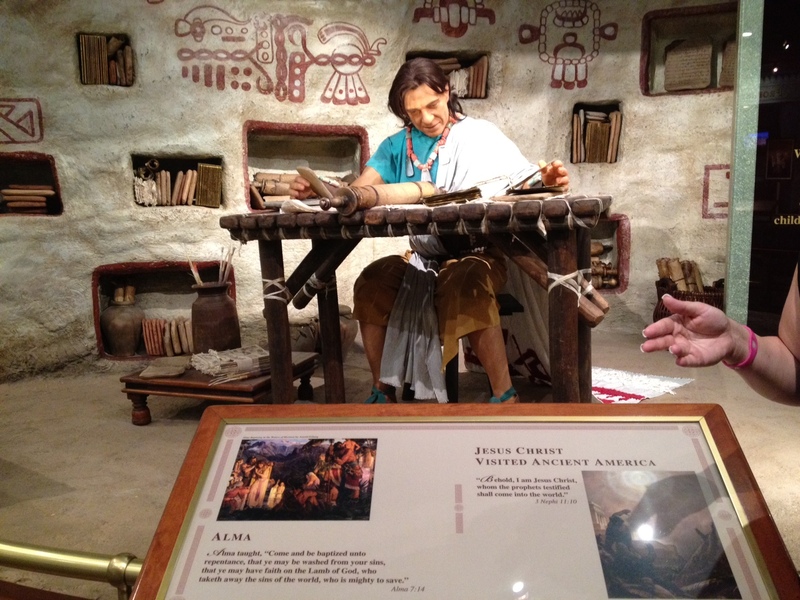 The signage in the picture was the only text available in the exhibit area and it could be a bit misleading because the label says “Jesus Christ Visits Ancient Americas” and “Alma.” The seated figure could have very well been the prophet Alma, but there was not any text explaining what the scene was depicting or if the seated figure was Jesus or Alma. The titles on the signage were followed by scripture quotes from other prophets within the Book of Mormon. Across the way was a depiction of the prophet Lehi and that exhibit also did not explain who the man in the tent was. It again had the title Lehi and was followed by a quote from a different prophet. I bought the Visitor’s Guide which has two pages dedicated to the subject of Mormon prophets in Ancient America as well as another two pages about Jesus in the Americas. Without a prior knowledge of Mormon prophets or the literature I purchased it would be difficult for non-Mormon visitors to the exhibit space to determine what was going on in the scenes. I purchased materials because I was genuinely curious and wanted to know more about everything at Temple Square and the Mormon faith. Based on what the tour guide stopped to talk about in front the Jesus/Alma exhibit and what I read in the Visitor’s Guide, I deducted that what I was looking at was a depiction of Jesus in the New World. I only listened to one interpretation of the exhibit and did not follow the group as they continued on to look at the display of all the languages the Book of Mormon has been translated into or images of all the contemporary leaders of the LDS Church. What I was troubled by was how literal the interpretation by the tour guide was as well as the way the material is presented in the Visitor’s Guide. It gives very little room for interpreting the material potentially as a parable opposed to an exact account of what happened. I’m sure each tour guide presents information differently and I could have heard a very different presentation from someone else. I was also surprised the exhibits in the North Visitor’s Center did not have more contextual explanation since a few different guides told me that many of the exhibits were designed to introduce non-Mormon visitors to the Mormon faith, history and culture. I will admit that I am an atypical museum visitor because I have a background in museum studies with a focus in curation, exhibition design,visitor observation and museum audiences. I will be making a return trip to Salt Lake City in June and am excited to visit some of the cultural institutions I did not get a chance to spend much time in during my last visit such as Brigham Young’s home, Daughters of Utah Pioneers Museum and hopefully will get to take in a rehearsal of the Tabernacle Choir. I completely agree with you. As a public historian I also pay close attention to the interpretation offered in exhibits, especially to identify silences and predominant narratives. I missed the exhibit when I visited Temple Square, but I was able to find some images in the official LDS website. Indeed, it is very puzzling the total lack of contextualization. From my point of view seems a little bit wasteful to set up such an exhibit without a greater level of interpretation. As a member of the LDS church, it doesn’t take me a lot of effort to identify the scenes represented in the dioramas. For those not involved with the church, however, it would not be very easy to make the right associations, as it happened with you. I even tried to contact them through email but their address doesn’t work! They truly have to work on understanding curatorial principles, and receiving feedback from visitors. If I can think of an explanation for such a sloppy job, it could only be that the church completely relies on “sister missionaries” (the young female tour guides) to do the interpretation. However, as your experience illustrates, the result can turn disastrous if the visitor doesn’t follow the guide or doesn’t ask questions. I wonder if this is “revisionist” or not since there is no historical support for the idea in the first place. It is one thing to rewrite history and another to offer fiction in its place.